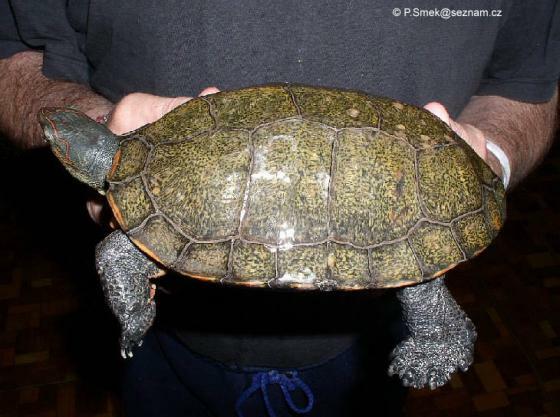 Can you confirm these amateur observations of Rhinoclemmys areolata? Belize, E Guatemala, E Honduras ? 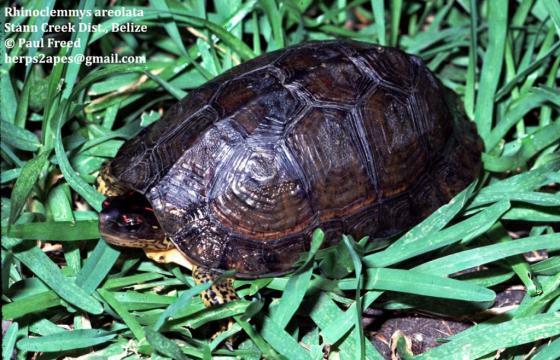 Type locality: "Province du Peten (Amer. centr. )"; restricted to La Libertad, El Peten, Guatemala by Smith and Taylor 1950:30; restriction corrected to Flores, El Peten, Guatemala by Dunn and Stuart 1951:60. Etymology The name areolata is derived from the Latin areolatus (with small spaces) and apparently alludes to the pattern of the growth rings on the carapace. Legler and Vogt (2013: 338) stated the name alluded ‘‘to a conspicuous pale spot on each lateral scute in juveniles,’’ but A. M. C. Duméril and Bibron, In A. M. C. Duméril and Duméril (1851), mentioned having only one specimen available of their Emys areolata, a ‘‘dry adult female’’ (Ernst, 1978: 117); thus, the authors of the name R. areolata could not have based their choice of the name on any aspect of juvenile coloration (McCranie 2018: 540).